Tomato plants growing in the Plant Development Habitat (PDHab) at BioServe Space Technologies. For a recent experiment on the International Space Station, the PDHab was loaded into a Commercial Generic BioProcessing Apparatus, a temperature-controlled microgravity research platform that has hosted a variety of experiments on numerous space shuttle, Mir, and ISS missions. Aeroponics, the process of growing plants suspended in air without soil or media, provides clean, efficient, and rapid food production. Crops can be planted and harvested year-round without interruption, and without contamination from soil, pesticides, and residue. Aeroponic systems also reduce water usage by 98 percent, fertilizer usage by 60 percent, and eliminate pesticide usage altogether. Plants grown in aeroponic systems have been shown to absorb more minerals and vitamins, making the plants healthier and potentially more nutritious. The suspended system also has other advantages. Since the growing environment can be kept clean and sterile, the chances of spreading plant diseases and infections commonly found in soil and other growing media are greatly reduced. Also, seedlings do not stretch or wilt while their roots are forming, and once the roots are developed, the plants can be easily moved into any type of growing media without the risk of transplant shock. Lastly, plants tend to grow faster in a regulated aeroponic environment, and the subsequent ease of transplant to a natural medium means a higher annual crop yield. For example, tomatoes are traditionally started in pots and transplanted to the ground at least 28 days later; growers using an aeroponic system can transplant them just 10 days after starting the plants in the growing chamber. This accelerated cycle produces six tomato crops per year, rather than the traditional one to two crop cycles. These benefits, along with the great reduction in weight by eliminating soil and much of the water required for plant growth, illustrate why this technique has found such enthusiastic support from NASA. Successful long-term missions into deep space will require crews to grow some of their own food during flight. Aeroponic crops are also a potential source of fresh oxygen and clean drinking water, and every ounce of food produced and water conserved aboard a spacecraft reduces payload weight, decreasing launch costs and freeing room for other cargo. In 1997, NASA teamed with AgriHouse Inc., of Berthoud, Colorado, to develop an aeroponic experiment for use on the Mir space station. Richard Stoner II, founder and president of AgriHouse, had worked with aeroponics since the late 1980s, and developed and patented a method for aeroponic crop production. AgriHouse utilized the research direction of BioServe Space Technologies, a nonprofit, NASA-sponsored Research Partnership Center located at the University of Colorado in Boulder, to assist its efforts in developing its aeroponic technology for space flight (Spinoff 2006). BioServe has extensive experience in space flight, having flown payload experiments on 27 shuttle missions, 2 Mir missions (one being the above-mentioned), and several missions on the International Space Station (ISS). The AeroGrow Seed Pod houses and protects seeds before germination and provides a platform on which to grow after germination. To continue NASA’s development of aeroponic technologies and offer a unique educational experience to students around the world, an experiment designed and built by BioServe recently flew to the ISS aboard the NASA Space Shuttle Endeavour on STS-118, in August 2007. This experiment, designed by Heike Winter-Sederroff, assistant professor of Plant Gravitational Genomics at North Carolina State University, will advance the science of growing food during long-term space expeditions and further the development of heartier varieties of tomato plants for farmers and gardeners on Earth. The experiment is also part of an educational effort involving as many as 15,000 K-12 students and teachers around the world, who will compare the growth and development of tomato plants in space with similar experiments being conducted in their own classrooms. Essential to the success of this research was ensuring the seeds were protected on the way to the ISS, and at the same time, unable to germinate before the start of the experiment. BioServe identified an ideal medium for this transport while meeting with representatives from AeroGrow International Inc., also of Boulder, Colorado. AeroGrow’s proprietary Seed Pod technology, developed for use in its AeroGarden kitchen gardening appliance, was admirably suited to the task in that it encased the seeds in a plastic framework, and thereby protected them during transit and ensured germination would not take place until proscribed by the experiment. 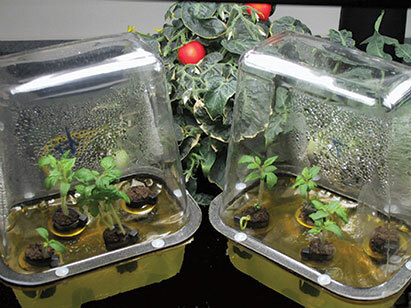 The use of AeroGrow Seed Pods on the ISS can be seen as the fitting fruition of an idea that sprouted several years ago. Bissonnette and colleague John Thompson were inspired by NASA experiments using aeroponic gardening to grow lettuce. The experiments reinforced that plants grown aeroponically did so significantly faster than those grown by any other method. Bissonnette and his team started working to capture this technology in a clean, simple, quick, and dependable appliance that would work in homes. The AeroGarden has proven a very popular way to bring the fun and reward of growing herbs, vegetables, and flowers indoors. More than up to the task, AeroGrow’s scientific board boasts a deep background in horticulture and aeroponics, and a depth of understanding that has helped the AeroGarden achieve such great success. For instance, Dr. Henry A. Robitaille holds undergraduate, master’s, and doctorate degrees in horticulture from the University of Maryland and Michigan State University. Notably, he helped design and implement hydroponic growing systems in The Land Pavilion at Epcot Center in the Walt Disney World Resort, collaborating extensively with the NASA Controlled Ecological Life Support System research team at Kennedy Space Center. Adapting a process as complicated as aeroponics to an automatic home appliance proved a considerable challenge and yielded impressive results. The more than 15 resulting patent applications include specialized lighting systems, nutrient tablets that nourish the plants and ensure standard pH levels regardless of municipal water supply, and the Plug & Grow Seed Pods that recently found their way to the ISS. 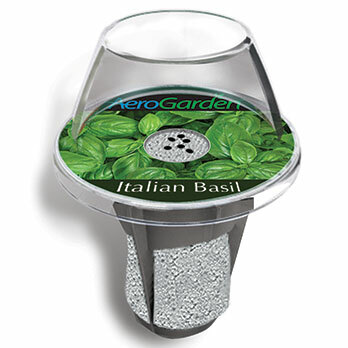 The appeal of the AeroGarden has been proven in recent years, as the company has shipped over 350,000 gardens. To this success, Bissonnette reflected, “We have succeeded in every retail channel of distribution we’ve rolled into, including independent culinary stores, national department store chains, independent lawn and garden and hardware chains, and have just concluded successful tests with multiple big-box retailers.” Though still largely rooted in Internet and infomercial sales, AeroGardens are now found in more than 4,300 storefronts. AeroGrow has set its sights on international markets while continuing to refine and enlarge its product line. Now applied in homes and schools nationwide, and with its Seed Pods seeing application on the ISS, the fruits of NASA’s work in past decades are made available in the simplicity of a kitchen countertop gardening appliance. AeroGarden™, Seed Pod™, and Plug & Grow™ are trademarks of AeroGrow International Inc.